In recent years hazardous phenomena has begun to take a larger role on the worldwide stage due to global climate warming, but also due to volcanic activity and earth plates’ movement. Tsunamis and earthquakes are much more destructive than before and much more frequent. Scientists have been developing methods to anticipate such events for many years, but the efficacy of such research is valuable when it’s a matter of a few minutes which may not be enough time to find a safe spot. In some cases, protection measures cannot even measure up to the destructive effects of tsunamis and earthquakes. Still, trying to fight back defines us as human beings and new solutions are explored every day to increase our safety. A tsunami is a series of very tall waves of water which are caused by a displacement of a body of water. Tsunami waves can reach up to 2 meters (6.6 ft.) to 14 meters (46 ft.) or more. On the ocean’s surface the wavelength can have up to 800 kilometers (500 miles) per hour, but it slows down upon approaching the coastal line getting to 80 kilometers (50 miles) per hour which has a devastating impact anyway. Almost 80% of tsunami activity has been recorded in the Pacific Ocean, but the risk also exists on mainland wherever there are lakes and active volcanoes or frequent earthquakes. An earthquake is generated when the earth’s crust receives a strong release of energy as a result of tectonic movement. Their magnitude is measured on two different scales: Richter and Mercalli. Earthquakes of more than 7 degrees can cause important damages to constructions which can fell apart within seconds collapsing over the people inside. Many earthquakes happen in the Pacific Ring of fire – a hot spot for about 81% of large scale earthquakes. If the epicenter of the earthquake – the point of origin – is located on the ocean’s floor it can lead to tsunami phenomena. Tsunamis are caused by earthquakes, volcanic eruptions, underwater explosions triggered by detonations, ocean floor plate movement. Tropical cyclones can also generate giant tidal waves. Earthquakes are caused by collision of tectonic plates, by volcanic activity or by underground explosions in mines. Teletsunamis are tidal waves generated by earthquakes causing waves which travel across the oceans. Megatsunamis are massive waves. The best example is probably a 1958 landslide in Alaska which created a wave measured at 524 meters (more than 1,700 feet) high. 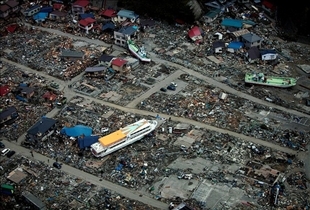 Tsunami’s can sweep everything on the coast line from houses to cars, trees, drowning people and animals. If the wave speed is very big the tidal wave can go beyond the coastal line flooding the city and destroying everything in its way. Earthquakes have caused deep craters, fatal damage to constructions, many losses of human lives in just seconds wherever they happened in the world. Japanese have developed even a rolling system for their blocks of flats to diminish the impact of earthquakes. Tsunamis are series of high tidal waves which can sweep people and constructions in seconds. Earthquakes are a result of tectonic plates’ movement which releases a wave of energy out to the surface. Tsunamis and earthquakes can be caused by volcanic activity or underwater explosions. Both tsunamis and earthquakes have destructive consequences. Cyborg vs. Android: What is the difference?